Heavenly Spirits LLC reintroduces ArmoriK Breton Single Malt. The oldest single malt whisky made in France is now available in the United States. 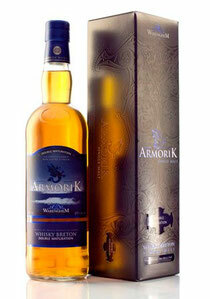 Originally introduced to the US market in 2006 as a light French single malt whisky weighing in at 40% ABV, Armorik, which is produced by Warenghem Distillerie, has since changed importers to Heavenly Spirits, increased ABV to the optimal standard 46% and updated its packaging, emphasizing the brands Breton Celtic roots. The results are worth noting and definitely worth tasting and sharing. So far, the new Armorik Classic has earned a gold medal from the BTI in Chicago, and is “Highly Recommended” by Paul Pacult in the Spirit Journal; while the Double Maturation was named “Best New World Whisky Single Malt under 12 years” at the World Whiskies Awards in 2012 and Best European Single Malt (World Whiskies Awards 2013). The Classic ArmoriK is made from100% French malted barley, aged almost 7 years in refilled American Bourbon casks, and finished in Olorosa Sherry casks for three months. The Double Maturation ArmoriK is aged 5 years in French Oak from the Armorik forest and at least two years in Olorosa Sherry Casks. See the rest of the Press Release by downloading the PDF.